Earlier this week, Apartment List released their city rent report for Houston. The result? 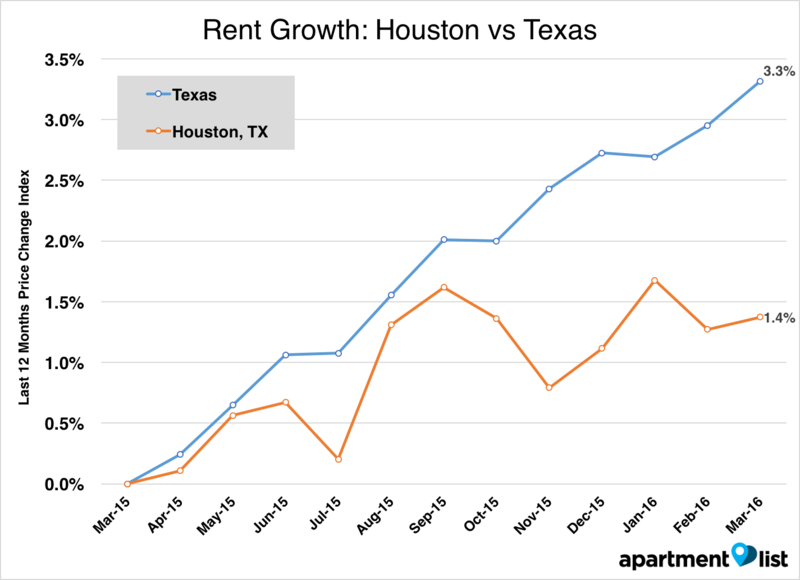 Houston rents continue to grow significantly more slowly than Texas (and the nation) overall. Over the last month, Houston rents grew by an average of 0.1 percent. Texas rents overall are 3.3 percent higher than last year, while Houston’s rents are higher than last year’s by 1.4 percent. 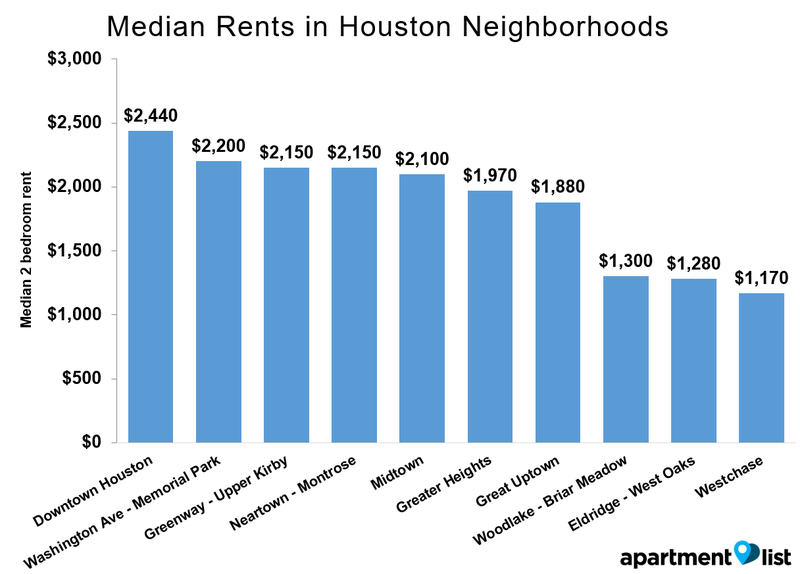 A 2-bedroom in Houston claims a median rent of $1,530, while a 1-bedroom goes for $1,210. Just as in last month’s report, Downtown Houston is the city’s most expensive neighborhood for renters, with a median 2-bedroom rent of $2,440 and median 1-bedroom rents of $1,650. These prices are actually lower than Downtown rents last year, by 2.1%. Washington Ave. – Memorial Park is relatively close behind, at $2,200 for a 2-bedroom and $1,610 for a 1-bed. With 2-bedroom apartments claiming a median rent of $1,170 and 1-beds renting for $930, Westchase experienced the largest rent growth over the past year at 2.7 percent. Close behind was Greater Heights, with rents 2.3 percent higher than the past year and 2-bedrooms going for a median rent of $1,970. 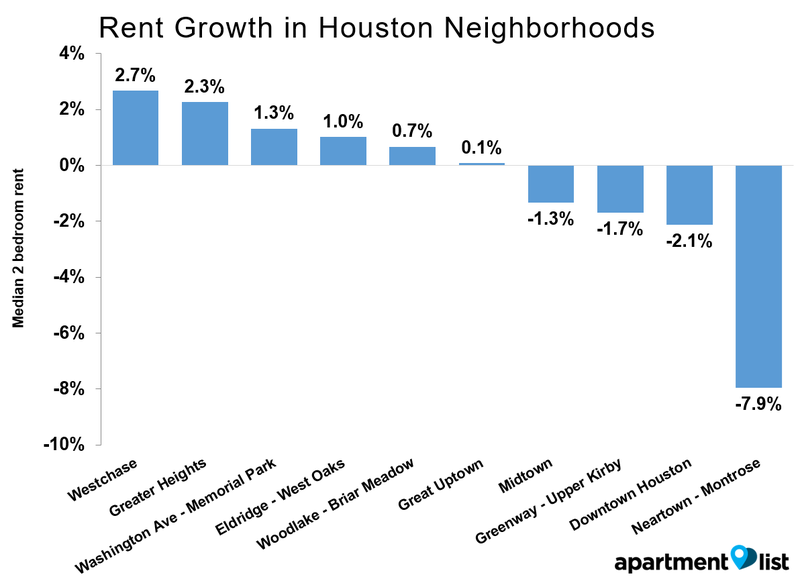 For methodology and data for other neighborhoods in Houston, see Apartment List’s City Report.